My blog this week is inspired by one of my housemates. While attempting to revise for our forthcoming exams (while having a mini Harry Potter Marathon) we decided that it is much easier to procrastinate than to actually get on with work. How many times have you opened a word document, tapped out the title and then thought to yourself ‘I’ve made a start, I’ll just check facebook/twitter/emails’ etc? (be honest). Yeah that’s what I thought. The dictionary definition is “to put off doing something that should be done straight away.” It happens to everyone, we all like a bit of time to do what we want and indulge in the wonders of social networking. It’s far more interesting than actually doing some work. But, in the words of my best friend, “if you get it done now, you’ll have way more free time later.” She has a point. 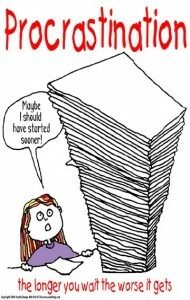 It has been said that if you could get a degree in procrastination, then every student would get a first. Sounds good to me. After all, as fab student website www.studentbeans.com puts it ‘We’ve been procrastinating ever since the cavemen couldn’t be bothered to go and catch a woolly mammoth because they were too busy watching the fire.’ However, it’s not really the best way to go about things, especially when your deadline is getting steadily closer. 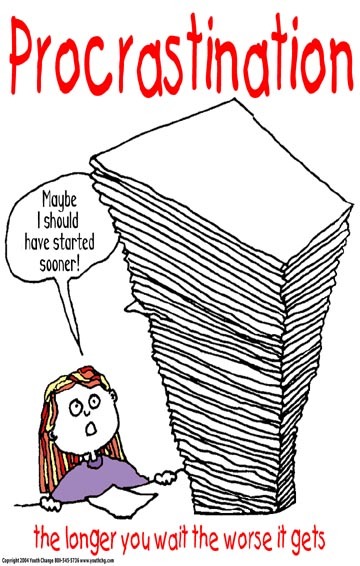 Need help kicking the procrastination habit? Seriously, it helps, because it encourages you to manage your time effectively as well as fitting in the fun things we want to do. 1. Get a friend or family member to confiscate your laptop when you’re revising. They’re really mean and won’t let you have it back, but it pays off in the long run. 2. Turn the internet off! If you do have to work on your laptop, turn off the internet and be disciplined about turning it back on. Apparently some browsers now let you set blocks on social networking sites so you can only visit them at certain times of the day. Try it. 3. Work in the same room as others who are revising. If someone is watching you, you’re more likely to get on with what you’re supposed to be doing! Sarah graduated from University in Summer 2012 and is no longer blogging for this site.